At first glance these two words would appear to refer to the same aspect of preparing and eating food. The effect food has on the person enjoying something good to eat. However, these two words are not the same. Taste is just one aspect of flavor. The real meaning of flavor encompasses far more than just taste as it is connected to the realms of other senses. Flavor refers to the smell and to the texture of food, as well as the taste of food. 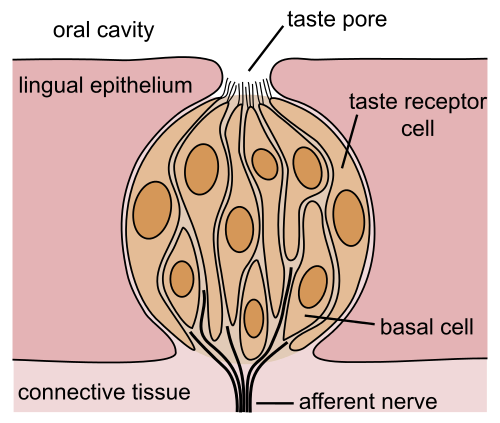 Taste refers to the actual connection of the tongue and taste buds in the mouth to recognize the basic tastes of sweet, sour, bitter salty and umami. Flavor is more of a sensory experience and this experience is evident in fine dining. Taste is the initial element of the flavor, but flavor takes on the whole party of sensory enjoyment. Flavor is very reliant on aroma, while taste is just the sensation of a taste alerting the mouth and tongue of the sensation of one of the familiar taste bud sensations. Taste is what takes place in your mouth when food or drinks make the connection with your taste buds. When a substance arrives on your tongue information is passed to the brain to alert the brain that the taste of sweetness, something sour or bitter, salty or umami a relatively new taste referring to a meaty savory taste sensation. When the tongue recognizes a taste sensation the taste buds, many many bumps on the tongue are alerted to the taste. Taste is experienced on the tongue and the soft palette of the mouth. Taste is one of the body’s five senses, but it does not include the sense of smell and that is a big part of what makes flavor unique. What is Different About Taste? Taste is one of the body’s five senses experienced in the mouth and n the tongue. Taste identifies sweet, sour, bitter, salty and umami tastes. 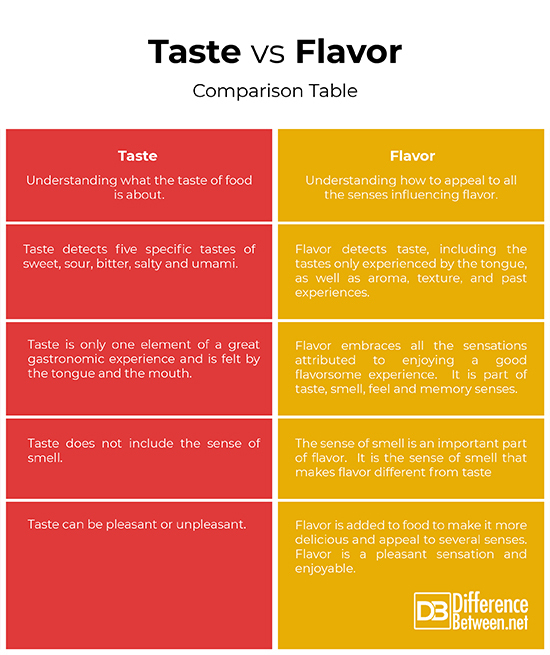 Taste alone does not identify flavor but contributes to the experience of flavor. Flavor is the fulfilling experience f taste and aroma together with sensing the texture f some foods. Aroma plays the biggest part in the sensory experience through flavor. The sense of smell is alerted to particles known as odorants that enter the nose when food is tasted. The smell receptors send a signal to the brain about the aroma of the substance you have eaten. Aroma can travel through the nostrils or through the back of the mouth along a passage known as the nasopharynx . In scientific circles this is known as retronasal olfaction. Smelling food before eating it and allowing the aroma to enter the nose through the nostrils or sniffing is referred to as orthonal olfaction and contributes to flavor sensations as the brain will identify with familiar food smells. Flavor also takes texture of food into account as the mouth reacts to soft or textured food sensations. Biting into a ripe peach for instance, will give the immediate sensation of the warm skin of the peach and the sweet juicy taste of the first bite. This is followed by an appreciation for the sugary taste or perhaps a sour taste if the peach is not quite ripe. The juicy flesh of the peach is enjoyed as the taste and aroma of the peach contribute to its flavor. What is Different About Flavor? Flavor is dependent on taste and aroma. The sensation of enjoying a flavor is not just about taste it is the connection to the aroma of the food in conjunction with taste, and the feel of the food in the mouth and the aroma of the food as the nose smells it by sniffing or through the nasal passage. Flavor is more important to a chef than taste. Flavor gives a whole sensory experience to the person eating the dish prepared. Specific herbs and spices contribute to the flavor that is sought after for some specialized dishes. The difference to the sensory attribute of these terms is shown by the importance of aroma in the understanding of how flavor covers a more holistic approach to enjoying food. Taste can only be experienced through the sensation of food on the tongue or in the mouth. Flavor allows the added sense of smell to improve the knowledge of what has been eaten. The aroma of the food is transmitted through the olfactory system via the nose and sniffing and the nasal passage at the back of the mouth connecting the nose and the mouth. Flavor has a far greater influence over what we eat. Going to a restaurant or cooking at home will allow flavor to be experienced even before the meal is eaten. The flavor factor is influenced by several of the senses like smell, touch and taste. Taste is just one of these senses. Simply catagorising a taste into sweet, sour, bitter, salty and umami does not make use of the other sensory organs used in judging the aroma of food. and the other senses are not used to judge taste. The senses that are used to detect flavor begin from the moment aroma enters the picture. It is possible to experience aroma through the sense of smell before eating something. Flavor is noticed when the restaurant is entered. A restaurant specializing in a flavor, a curry restaurant for example, will have that curry aroma to promote the dishes available on the menu. This sense of aroma adds to the ambiance of the restaurant. Preparing food that tantalizes the appetite needs flavor not just taste. The chef who understands that outstanding aroma is the key to creating a wonderful dish will have a better chance at attracting customers to sample his culinary delights. The creative chef will add artistic presentation to complete the sensory experience. Taste is part of the picture that tells the consumer about flavor. Taste is one of the elements of flavor but is limited to sweet or sour, bitter, salty, or umami tastes that connect to the taster’s taste buds. Flavor is more intense because of the added part played by aroma. 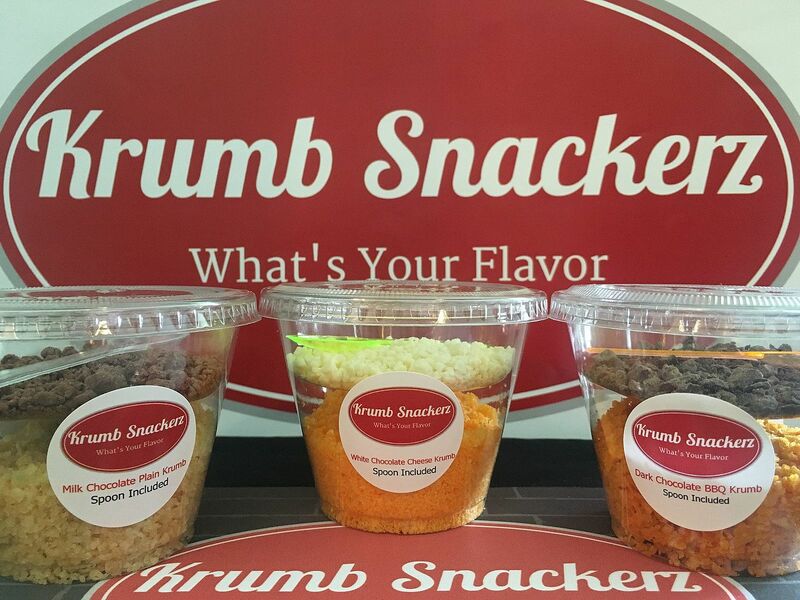 Flavor builds onto taste and enhances the food experience with more sensory experiences. An unpleasant aroma would detract form the taste of the food and prevent a person from wanting to taste what is presented. Food that is bad for example will have a bad smell and will not be tasted. The unpleasant aroma deters someone from eating that item food. Flavor is used in a positive sense as the word encourages diners to eat certain foods. While taste can be simply a means to sample a food or something needing to be tasted, not necessarily eaten for the whole gastronomic experience. Medicine can be tasted and is good for healing, but not necessarily have a great taste. It could be bitter for example. While taste and flavor go hand in hand in the world of cuisine, the flavor component is more complex. Flavor is influenced by the olfactory sensory system and more scientific in relation to the understanding of how flavor works. Taste is simply one of the five senses used in sensory experiences. Christina Wither. "Difference Between Taste and Flavor." DifferenceBetween.net. November 12, 2018 < http://www.differencebetween.net/miscellaneous/difference-between-taste-and-flavor/ >.